Posted 1:00 am by Michael Moser & filed under Dragon Medical Practice Edition. What provider wants to be bogged down in paperwork, filing, and transcription for several hours a day, every day of the week, at the expense of patients? None that we know of. That has influenced many small medical practices to integrate Dragon® Medical Practice Edition 2 into their workflow and EHR. But does it deliver? Is this latest version of the speech recognition software worth its weight in increased productivity? After nine months on the market, the answer seems to be that it’s a winner. For any provider who values speed, Dragon Medical Practice Edition 2 is definitely faster. The program has been enhanced and optimized to be faster than it’s predecessors on a variety of processors and 20 percent more accurate at recognizing speech. For a provider who may have experienced an increased patient load in the past year, being able to transcribe and correct even faster with fewer errors is a major plus. Another feature that helps deliver a smoother, faster workflow is the transparent dictation window. This latest version allows the user to set up that window to receive text, no matter what other applications might be open. That dictation window can be made hidden or visible, or set at a certain degree of transparency so that text can be viewed through another application that may be open at the same time like an EHR chart or medications page that is being referenced in the dictation. For Bluetooth users, integration is easier with Dragon Medical Practice Edition 2. The software supports the wideband, Bluetooth wireless headset mics for quick activation. When it detects a USB device from a wideband mic is plugged into a PC, Dragon Medical Practice Edition offers ‘enhanced Bluetooth’ as an option without the need for a script. For providers who travel a lot, Dragon Medical Practice Edition 2 can now be used remotely – on a computer that uses Windows Server 2008 R2 or Windows 7 Ultimate. 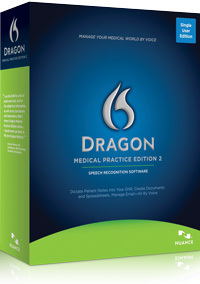 With free remote desktop connection software from Microsoft, anyone can use Dragon Medical Practice Edition on the computer where it is installed from a remote computer. And Dragon Medical Practice Edition can be used at the same time by multiple user’s remote desktop sessions as long as each user has a valid license. It’s safe to say that Dragon Medical Practice Edition 2 has been enhanced across the board, which translates into providers who are more satisfied with their work. Dragon Medical Upgrade – If it isn’t broken, why fix it?